TEHRAN - Mes Sungun Varzaghan of Iran overcame a stiff challenge to defeat Iraqi Nafit Al-Wasat 3-2 and booked its spot in the AFC Futsal Club Championship Indonesia 2018 final on Friday. 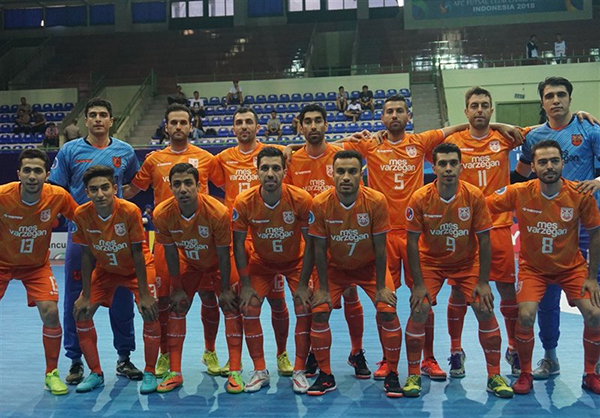 Ali Asghar Hassanzadeh (twice) and Farhad Fakhim scored for Mes Sungun and Ghodrat Bahadori and Salim Faisal were on Target for the Iraqi futsal team. Mes will face the winner of the Thai Son Nam - Bank of Beirut semi-final, being played later on Friday, in Sunday's final. The 2018 AFC Futsal Club Championship is the 9th edition of the AFC Futsal Club Championship, an annual international futsal club tournament in Asia organized by the Asian Football Confederation (AFC). Iranian futsal clubs Foolad Mahan, Giti Pasand Isfahan and Tasisat Daryaei have won once the AFC Futsal Club Championship.